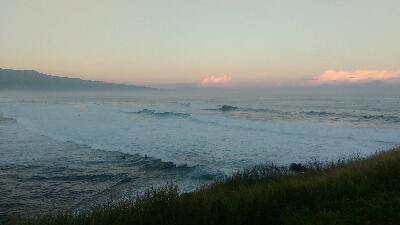 7am Hookipa chest to head high and poor shape. The massive thanks of the day go to blog reader Michael for his donation. The 2017 blog season appreciation week ends today, the Paypal button is on the right. 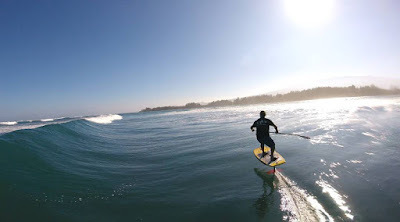 A shortboard and a windfoil session for me yesterday, but this photo by Tomoko is from two days ago (Friday) and shows me at the start of a backside cutback on the SUP foil. Once again, don't judge it with the eyes of the surfer, as it's a completely different sport. You can tell by my look how focused I am and despite the lack of big body movements, every little muscle of my body is engaged in keeping the board at the right angle. I often say that foiling is the most subtle discipline I've ever done. Talking about SUP foiling, I'm selling my Kai foil as I've ordered a Kai/Iwa/Maliko 200 combo in order to minimize the number of masts. Here's the Craigslist ad. No indication of southerly energy at the buoys, the Surfline forecast calls for 1f 9s. Probably flat. Progressively smaller and less north readings of the WNW swell as you move down the island chain. Notice also the direction at the SW buoy. With such small energy at Pauwela, my guess is that the dominant energy on the north shore will still be those 4f 8s from 40. The Pacioos spectrum diagram below seems to agree with me. 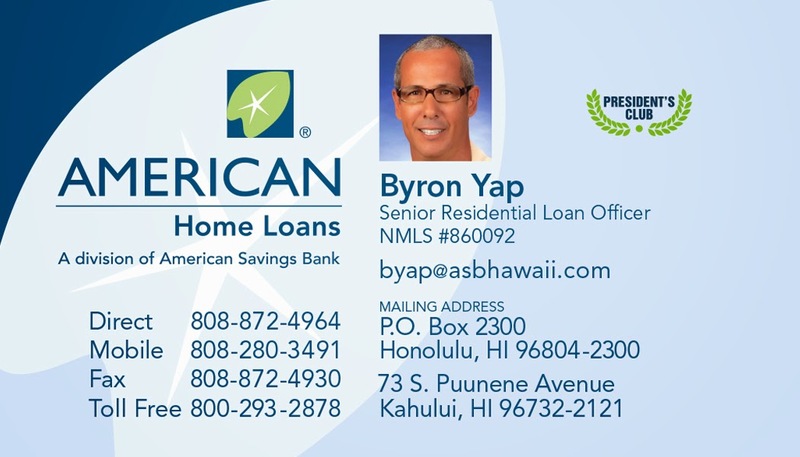 Stay tuned for a Hookipa beach report later. Wind map at noon shows easterly trades. North Pacific shows a WNW fetch and a leftover NE windswell one. 7am Hookipa has residual head high occasionally higher sets from the north. Wind is light. The massive thanks of the day go to blog reader Robynne for her donation. The 2017 blog season appreciation week continues, the Paypal button is on the right. Sup foiling and windfoiling sessions for me yesterday, both fun. 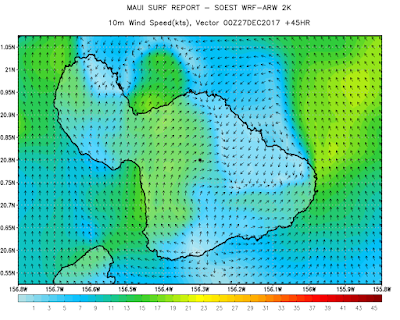 Classic example of how a day was saved by the foiling, I would have not had as much fun doing regular surfing or windsurfing. Until I receive the new camera, we got to live with the photos from Dec 27 by Jimmie Hepp from this gallery. This is Robby Naish. 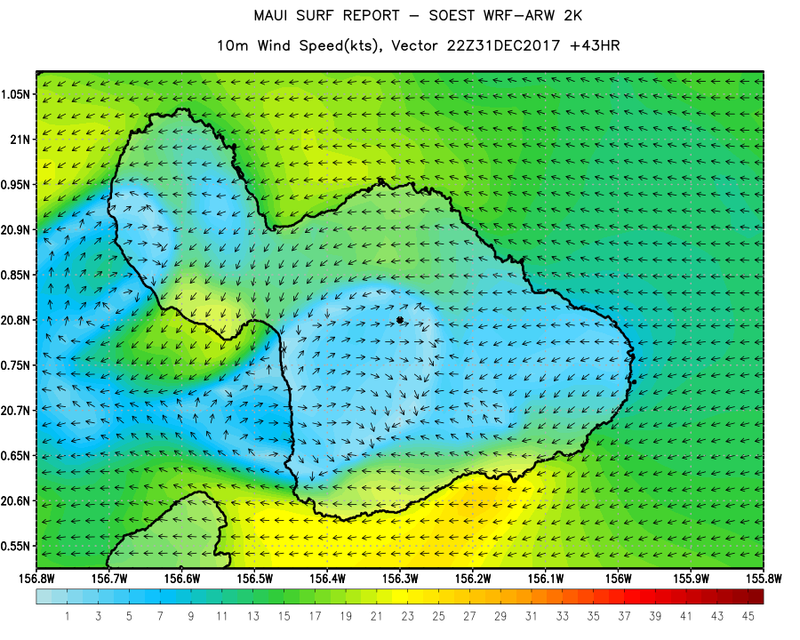 No indication of southerly energy at the buoys, the Surfline forecast calls for 1.4f 10s.Waves on the Lahaina side were knee to occasionally waist high yesterday. New low long period WNW swell on the rise and old short period N swell on the decline. 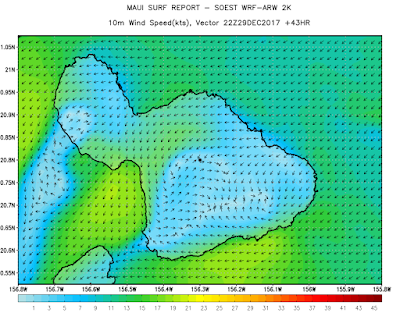 Maui's best swell direction (IMO) is about to be replaced by its worse direction. This swell comes for that fetch off Japan we observed in the last 3-4 days. We're gonna be blocked by all the upstream islands and the only place that will eventually get some energy will be Hookipa. 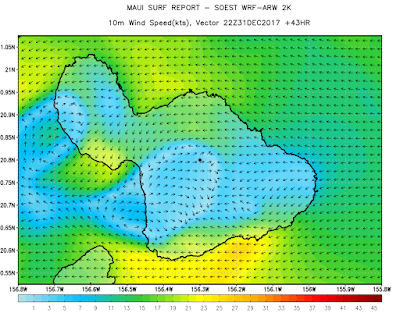 The buoy readings this morning show a perfect example of how the swell refracts around the island chain (don't forget there's islands also NW of Kauai), I'm actually surprised that Pauwela does feel something. (that 18s reading is obviously not from the NNE). Fortunately, there's still a bit of energy in the water from the N and that's what I would base my spot search on. 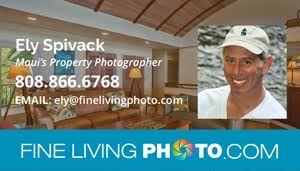 Nonetheless, I will probably post an Hookipa beach report later. North Pacific shows a persistent WNW fetch. Morning sky. Should be another stunner. 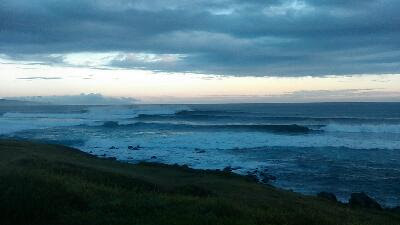 6.30am Hookipa has head to occasionally head and a half peaks of poor shape. The massive thanks of the day go to blog readers Guido for his donation. The 2017 blog season appreciation week continues, the Paypal button is on the right. Just a lovely glassy longboard session for me yesterday, as the afternoon had the predicted onshore flow. No photos of the day, here's another gem from this gallery by Jimmie Hepp. 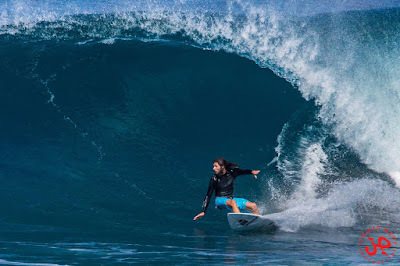 Matt Meola on a clear 10. 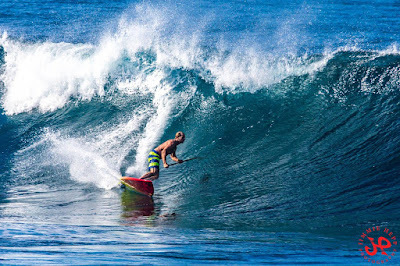 December 27 might easily end up being the best day of the season for Hookipa. Hopefully not. 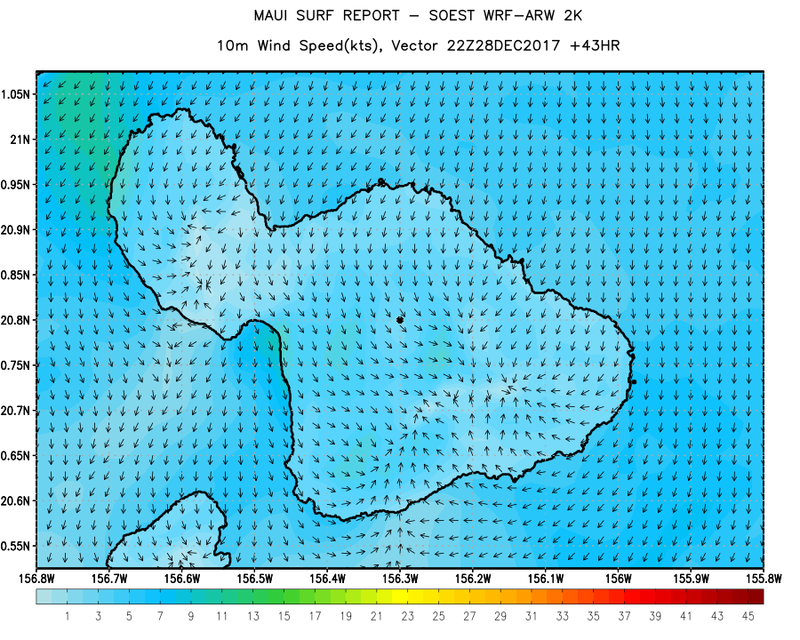 No indication of southerly energy at the buoys, the Surfline forecast calls for 1.6f 11s and I heard of decent size waves in Lahaina yesterday. Northerly energy still hanging in there, even though with multiple shorter periods. The waves won't be particularly clean on the north shore for the next couple of days, because of the NE trades. Starting Sunday, the trades should turn easterly and that's better, specially for the early morning sessions. Wind map at noon shows light to moderate NE trades. North Pacific shows a WNW fetch and a sliver of remaining northerly fetch. South Pacific shows a tiny little fetch that I'm afraid won't do much for us. Morning sky looks deceivingly nice, as there's some rain on the north shore as I type this call. The massive thanks of the day go to blog readers Geoff, Dave and Scott for their donations. The 2017 blog season appreciation week continues, the Paypal button is on the right. Massive day of surfing for me yesterday, with four shortboard sessions, which remains my favorite discipline to do when the waves are good. Yesterday they were actually excellent. Here's an abstract of a conversation with the Peahi Challenge champion Paige Alms at a party in the evening. Paige:"I saw Tanner on a wave that was the best one I've ever seen at Hookipa, and I've surfed it since I was 10 years old. It just opened up in a massive barrel and he was in it standing tall for like 5 seconds!" Me:"Wow, that's something. Well, that was obviously a 10, but what would you rank the overall conditions?" Paige:"I give it a 9"
And since I scored it exactly a 9 in two of the beach updates, I couldn't stop a smile and a little fist claim. 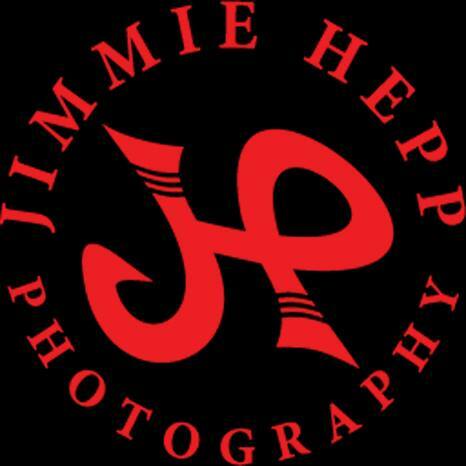 Tough day to be without a camera, but fortunately Jimmie Hepp was on duty. I had no time this morning to go through it, so I just grabbed the very first shot of Ridge Lenny from this gallery. Check it out, I'm sure there's some gems. It was just totally epic out there. No indication of southerly energy at the buoys, the Surfline forecast calls for 1.7f 12s, I got a report of barely knee high Thousand Peaks yesterday. 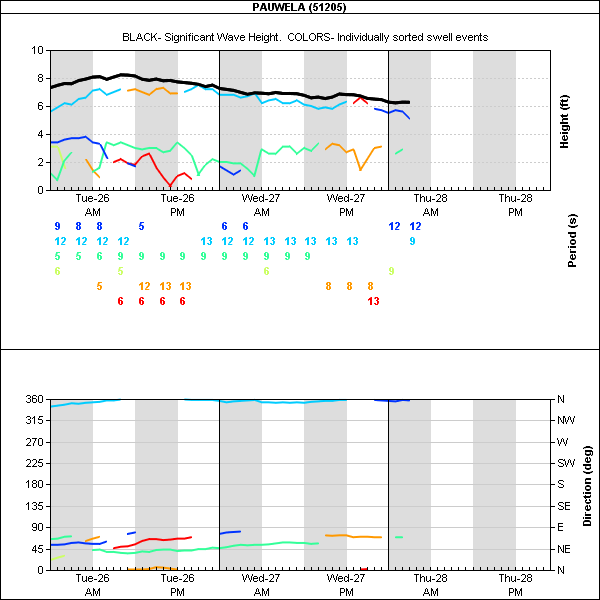 Still some lovely northerly energy at the buoys, below is the graph of Pauwela showing a gradual and slow decline. 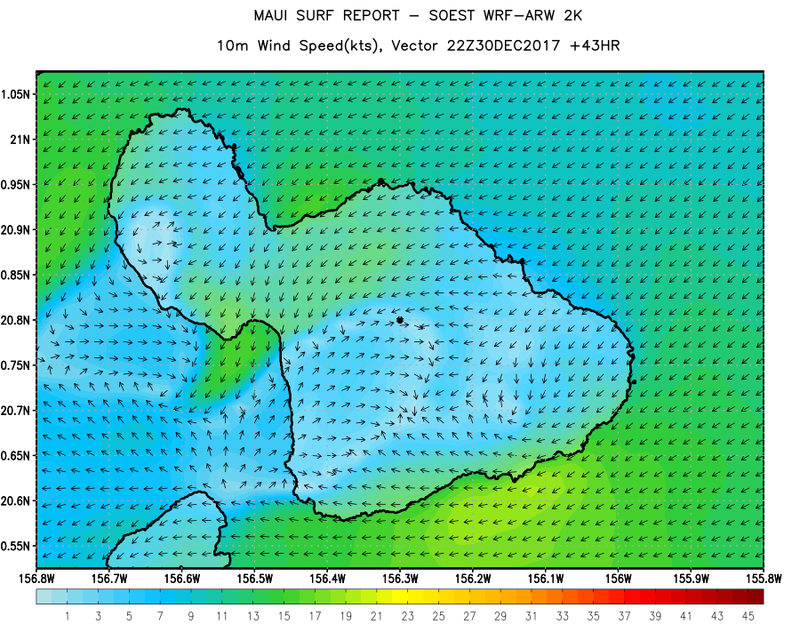 With the ideal early morning wind conditions, the surf should be in the excellent range again. No time for beach updates for me this morning, as I have surf guiding obligations. Wind map at noon shows very light onshores, getting slightly stronger as the day progresses. The morning should provide excellent wind conditions instead. North Pacific shows a WNW fetch (soon to become the dominant direction) and a residual north one. The satellite close up maps are back online, here's the morning sky. The front has passed, it should be stunning day. Another one. 2pm swell consistency is slightly going down at Hookipa, but there's still sets. Some waves are 10s, but overall I confirm the 9. 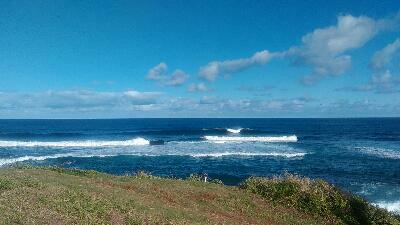 7.30am Hookipa is definitely double overhead and beautiful. 9 if you can handle. 6.30am Hookipa has head and a half to occasionally double. Seems clean in the semi darkness thanks to the light konas. Massive thanks to blog readers Lance, Gale, Kathy, David, Right Brain Communications, Oshri, Ioannis and Dan for their donations. Camera's money is reached and I ordered it already. But I'm going to continue asking for donations till the end of the year. Despite the significant amount of time I put into it, in fact, this website will never be a subscription one. If you enjoyed the posts I did in 2017, you have an opportunity to show your appreciation through the Paypal donate button on the right. 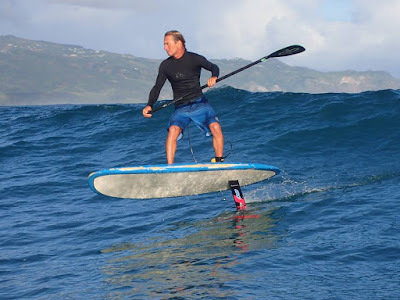 Yesterday I had a SUP foiling and a longboard sessions. Man, are those disciplines different! I couldn't take a photo of the day, but fortunately I have a couple of contributing photographers that I can use for that. Still searching for a west side one. 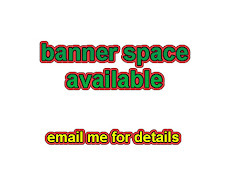 Free banner and link to any website every time I use a photo. This is Dave Kalama enjoying a glide over glassy water in a remarkable shot from Jason Hall. As predicted well in advance, yesterday the wind conditions were good pretty much everywhere on the north shore. No indication of southerly energy at the buoys, the Surfline forecast calls for 1.2f 15s, coming from a small fetch east of New Zealand that happened on Dec 19, 20 and 21, which are the three maps collaged below. The wind will be southerly today though, so not good for the south shore. Plenty northerly energy on the north shore. 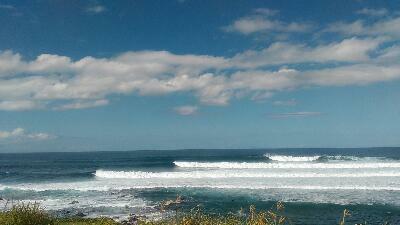 With the help of the SW wind, I'm predicting a high score for the conditions at Hookipa. Stay tuned for a beach report around 6.30am. 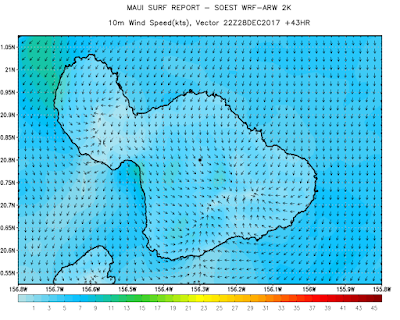 The wind today should start off as Kona (blowing 14mph in Kahului at 5.30am, but lighter up the coast) and then slow down towards mid day. The noon map below shows an inversion line somewhere around Hookipa. When the color is light blue, we're talking 1-5 knots, so it doesn't really matter where it comes from. Gonna be good for surfing all day again. North Pacific shows a good distant WNW fetch off Japan, a small N one and a small easterly windswell one. 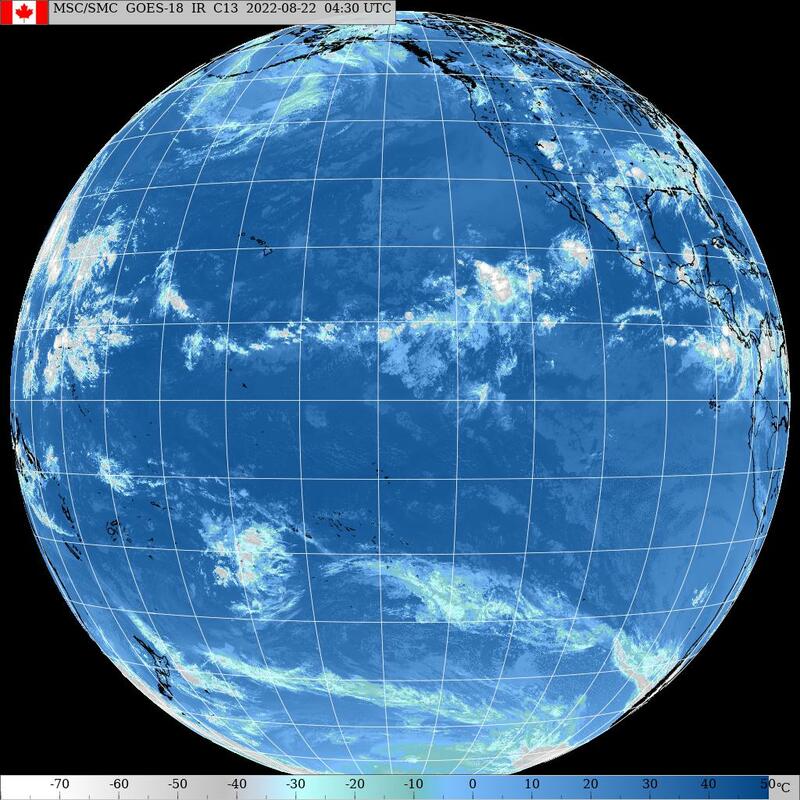 South Pacific shows a small fetch east of New Zealand. Morning sky shows that a sub-front just passed over us. There was some heavy rain during the night, but the worse should be passed. The wind is still Kona though, that means the front is not completely passed just yet. That'll happen tomorrow mid day. 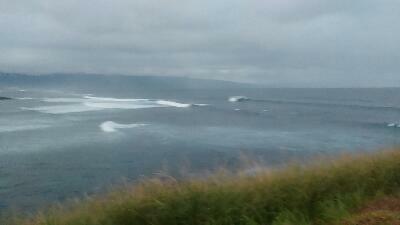 7am Hookipa has double overhead waves pretty washed out at high tide. ATTENTION READERS: MY CAMERA DIED AND I NEED TO BUY A NEW ONE. PLEASE SEND A DONATION THROUGH THE PAYPAL DONATE BUTTON ON THE RIGHT IF YOU WOULD LIKE TO CONTRIBUTE. ANYTHING HELPS! THANKS. Two shortboard sessions and a windsurfing one for me yesterday and yet another gorgeous day of waves was in the books. After the first session I wanted to take some pictures at Hookipa, but sadly my camera died shortly after I started shooting. This is the last picture you'll see from it and it will be a little while before I get another one. I use it pretty much exclusive for the blog and, as stated above, I could use some help. Think about those pictures of Sunny Garcia yesterday. Worth a buck or two? No southerly energy at the buoys, the Surfline forecast calls for 0.6f 15s, but only starting at 2pm. It should be a little bigger the next couple of days. 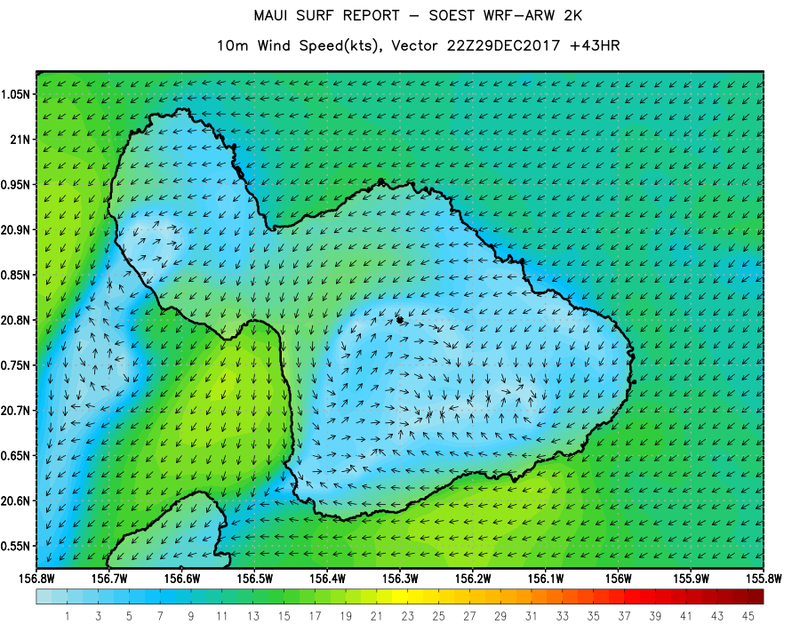 The predicted NNW reinforcement pulse did arrive yesterday afternoon (some sets at Hookipa were pushing mast high) and the energy should be pretty steady all day. Below is the collage of the three reported buoys that shows just that. Three wind maps today. You can check them yourself with link n. -4. Just play with the "tau" parameter in the address to obtain different times of the day. Example: tau=38 takes you the map of 16Z, which is 6am HST, tau=40 will be 8am and so on. The first one is 10am and it shows a southerly flow everywhere. The second one is noon and it shows an onshore very light flow on the north shore. The red circle indicates the offshore wind direction. You want to look on the map upwind of the island and offshore enough for that. When it gets closer to the mountains, the wind wraps around them and can greatly change direction and intensity, like it does in this case right at the easternmost tip. This one is at 2pm and shows the southerly flow squeezing between the two mountains and shooting out with moderate speed on the north shore. North Pacific shows a distant WNW fetch and the northerly one responsible for the current swell moving away from us. Weak pretty insignificant fetch down south. Big Blue shows those two lows you can see in the fetches maps and I put arrows to indicate the directions where they're moving. I'm missing the closeup image quite a bit, since it had animation. If someone finds an alternative to that (link n.6), please let me know. Radar shows some rain n Oahu. 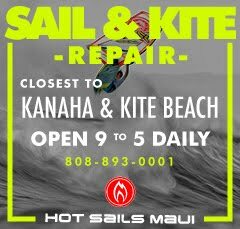 9.30am conditions at Hookipa are deteriorating as the light trades are picking up. The point still ok, but with a medium crowd. 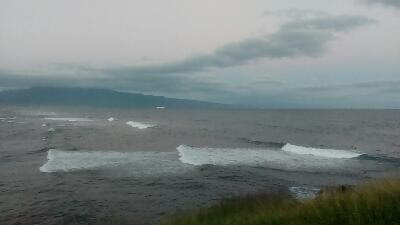 7am Hookipa is head to head and a half with very light wind. Bit bumpy/fat because of the high tide. Shortboard surfing, SUP foiling and windfoiling was the fat three sessions bounty of yet another gorgeous sunny day of waves in paradise. For me, it's Christmas every day. In between sessions I took some photos at the harbor where a fine spectacle of surfing was displayed by some very qualified names. We'll start with Ridge Lenny. I like how the spray of his turn mixed with the white water of the wave in the back and looks like snow. Here's a section dedicated to his much more famous brother Kai. Unfortunately I blew the framing in this one, but it's good enough to appreciate a very Tom Currenish bottom turn. Which resulted in an explosive top turn. And a backside snap for good measure. 99% of the time, when you ask Kai how was it, he's gonna answer:"super fun!". Well, he wasn't lying this time and I think he actually never lies about that. He's so good that he can always have fun in all conditions. And while I was sitting on my chair doing my hand held photo shoot, the sun got suddenly obscured by the massive figure of Sunny Garcia walking in front of me. The guy is built rock solid. He put up a barrel show on a lovely Stewart longboard. We carry a bunch of those at Hi-Tech. I don't know how many times he has surfed that wave, but he sure didn't seem to have any problem tuning into it. 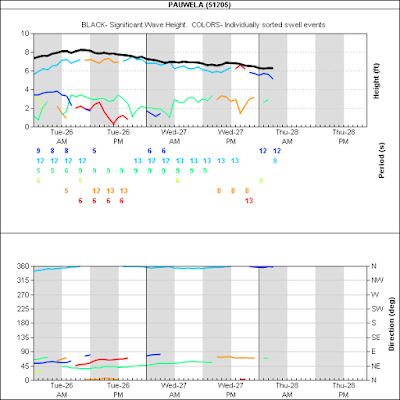 No indication of southerly energy at the buoys, the Surfline forecast calls for 0.7f 10s. Yesterday's swell was a beauty, but as predicted it declined pretty quickly during the day. No big deal, because a reinforcement is right on its heels. The collage below shows the graphs of NW101, Pauwela and the Surfline forecast. The red arrow indicates that the reinforcement pulse at the NW buoy started mid day yesterday. By applying GP's rule for the travelling time (16h @ 16s +/- 1h per 1s), at 12s the waves should take 20 hours to get here, so we can expect the increase to start around 8am this morning. 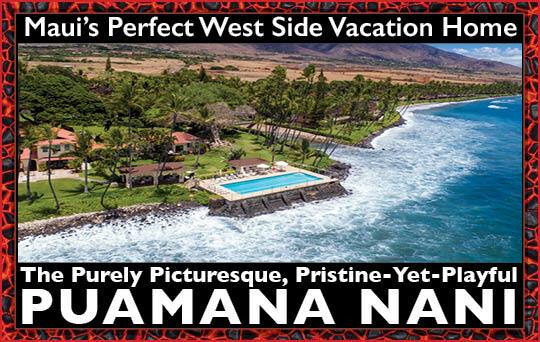 But Waimea hasn't registered it yet, so it might happen a bit later than that. The forecast calls for much bigger numbers, but it won't be the 7 feet it indicates, more like 5-6 IMO. 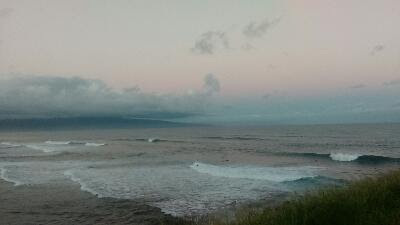 Stay tuned for a beach report from Hookipa before 7am. 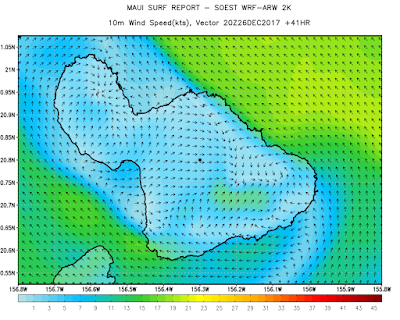 Wind map at noon shows easterly trades and possible sailing conditions on the north shore. 4) a lovely northerly one out of a low that is unfortunately moving NE away from us. Nothing of relevance in the South Pacific as you would expect in the middle of their summer. The closeup satellite page is not working, this other one is a little less zoomed in, but still good to appreciate the morning sky and a weak front approaching Kauai. The front will be responsible for some ideal southerly wind conditions tomorrow. 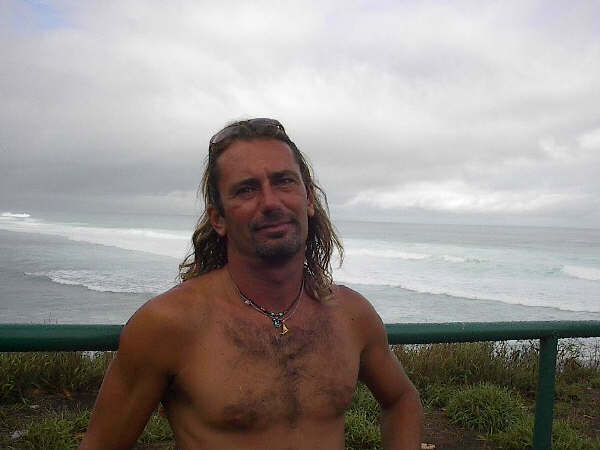 A returning surf guide customer is here for two weeks and asked me to pick two days to take him out for a couple of sessions, for sure we'll be surfing somewhere tomorrow. It's all about the wind, really.